In an unprecedented study of a solar eclipse's influence on bee behavior, researchers at the University of Missouri organized a cadre of citizen scientists and elementary school classrooms in setting up acoustic monitoring stations to listen in on bees' buzzing—or lack thereof—as the 2017 eclipse passed over. The results, published October 10 in the Annals of the Entomological Society of America, were clear and consistent at locations across the country: Bees stopped flying during the period of total solar eclipse. "We anticipated, based on the smattering of reports in the literature, that bee activity would drop as light dimmed during the eclipse and would reach a minimum at totality," says Candace Galen, Ph.D., professor of biological sciences at the University of Missouri and lead researcher on the study. "But, we had not expected that the change would be so abrupt, that bees would continue flying up until totality and only then stop, completely. It was like 'lights out' at summer camp! That surprised us." As anticipation mounted for the eclipse, "it seemed as if everyone and their dog was asking me what animals would do during a total eclipse," Galen says. However, few formal studies had ever examined the behavior of insects, specifically, during a solar eclipse, and none had looked at bees. 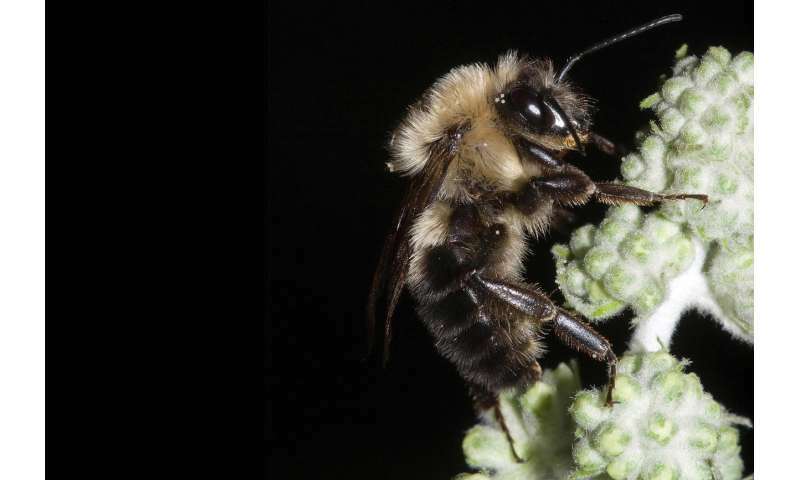 Galen and colleagues, meanwhile, had recently field-tested a system to track bee pollination remotely by listening for their flight buzzes in soundscape recordings. "It seemed like the perfect fit," Galen says. "The tiny microphones and temperature sensors could be placed near flowers hours before the eclipse, leaving us free to put on our fancy glasses and enjoy the show." Supported by a grant from the American Astronomical Society, the project engaged more than 400 participants—including scientists, members of the public, and elementary school teachers and students—in setting up 16 monitoring stations in the path of totality in Oregon, Idaho, and Missouri. 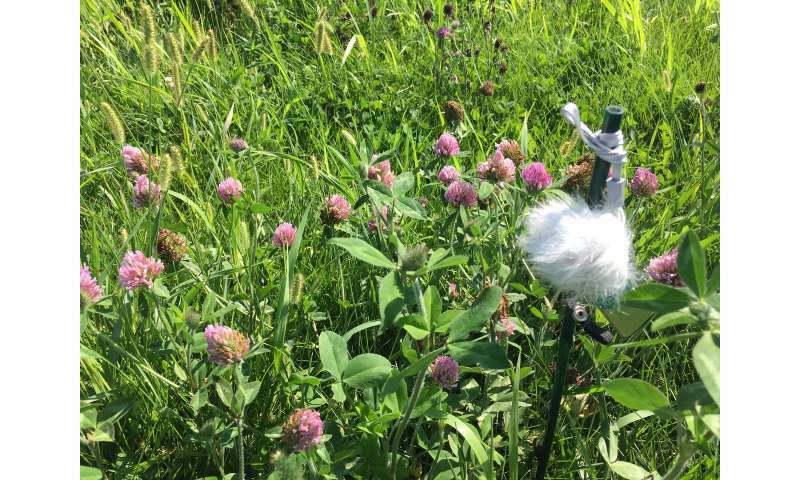 At each location, small USB microphones were hung on lanyards near bee-pollinated flowers in areas away from foot and vehicle traffic. In some of the locations, light and temperature data were also captured. Participants then sent the devices to Galen's lab, where the recordings were matched up with the eclipse periods from each location and analyzed for the number and duration of bee flight buzzes. The recordings didn't allow for differentiation between bee species, but participant observations indicated most bees monitored were bumble bees (genus Bombus) or honey bees (Apis mellifera). "The eclipse gave us an opportunity to ask whether the novel environmental context—mid-day, open skies—would alter the bees' behavioral response to dim light and darkness. As we found, complete darkness elicits the same behavior in bees, regardless of timing or context. And that's new information about bee cognition," Galen says. Another total solar eclipse for North America is not far away: April 8, 2024. Galen says her team is working to enhance its audio-analysis software to distinguish the flights that foraging bees make when they leave or return to their colonies. Thus prepared, she hopes to answer the question of whether bees return home when the "lights go out" at totality in 2024. It likely won't be difficult to find willing citizen scientists and students to help out again. "The total solar eclipse was a complete crowd-pleaser, and it was great fun to hitch bee research to its tidal wave of enthusiasm," Galen says.